Lisa Blue Baron selected Vogel Alcove as the beneficiary of her annual holiday party that took place in December 2013. Ms. Blue Baron announced early last fall that the Baron and Blue Foundation would match every donation dollar-for-dollar donated by her guests to support homeless children in the community. 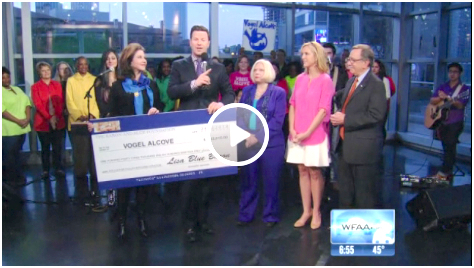 Together, Ms. Blue Baron and her guests raised $386,000 in support of Vogel Alcove’s City Park Project. The three-story renovated facility in the former City Park Elementary School location will allow Vogel Alcove to expand its capacity by 65% in order to provide essential services for nearly 200 homeless children from local emergency shelters, domestic violence shelters, and transitional housing programs.